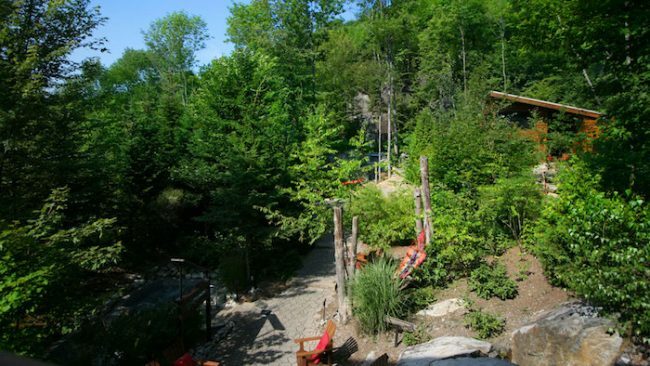 Spa La Source – La Source Bains Nordiques – just outside Rawdon, Quebec, is a tranquil nordic spa in the heart of nature. 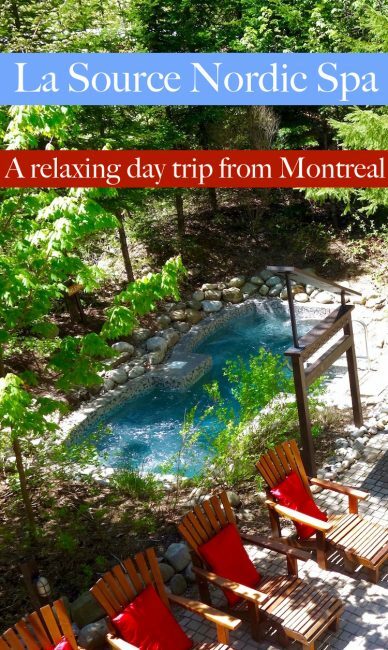 If you’re looking for a relaxing day trip from Montreal where you can soak, sit and soothe your muscles, this one-hour drive into the beautiful Lanaudiere region of Quebec will give your mind – and body – a break. I’m climbing a hill in the forest and my right flipflop is perilously close to falling apart. I’m reminded of the scene in the movie Wild, when Reese Witherspoon’s hiking boot falls off a precipice while she’s hiking the rugged Pacific Crest Trail. The difference is that she had to carry on through rough hostile terrain while I only have to finish the one-kilometre Meditation Circuit to get back to the outdoor pools at Spa La Source an hour north of Montreal. The other difference is that every obstacle fate throws in Reese’s way teaches her something about life and redemption – and the only thing I’ve learned is that I need a new pair of flipflops. But I haven’t come to Spa La Source, an outdoor nordic-style baths and spa complex in the Lanaudiere region of Quebec to learn or even to think. I’ve come to relax – because that’s why La Source Spa exists. PS: The director of the movie Wild is a French Canadian from Quebec, Jean-Marc Vallée. And natural and peaceful it is. I was first here three years ago and the cedar sauna, steam bath, outdoor whirlpool baths and faux (not to mention freezing) waterfalls were about as close to wood nymph happiness as you could get. What’s new since then is the Meditation Walk, which is why I’m doing it now. Don’t disturb me. I’m meditating. After passing a rock pond, a colourful hammock and a couple of tent-like burgundy cocoons, I stop at one of the meditation stations. The info plaque is all in French, but since my French is absolutely fantastic I have no trouble translating. Stop. Breathe. Imagine you are very fat and getting fatter. No, that can’t be right. I shake my head. Perhaps my French isn’t as good as I thought. I’m up in the hills! I read the plaque again, and come to the conclusion it’s telling me to breathe and imagine that the trees are getting bigger. No one is around so I touch a tree trunk just in case I can tap into its earthy arbor energy. Another station reminds me to breathe, to be in the moment and to exhale slowly. There is a rocky cliff behind me, so I touch that, too. Two girls wearing white hooded robes and carrying walking sticks come up behind me, looking for all the world like Trappist monks on pilgrimage. La Source Spa is that kind of place, a wellness pilgrimage where the destination is tranquility, and where, if you occasionally feel the need to touch a rock or a tree, no one is going to look at you strangely. I wait until they’ve passed by so I can have the Meditation Walk all to myself again. It’s not easy hugging trees and cliffs when other people are around, no matter how sympatico. Luckily, La Source caps their facility at 150 people per day, so there’s no chance of it ever getting too crowded. 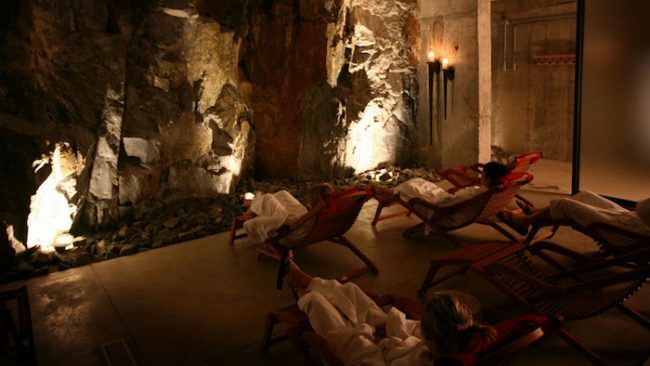 Here’s another secret, in case you don’t know what a nordic spa such as La Source is or what to do here. Nordic Baths are made up of a series of hot and cold water-based treatments, also called hydrotherapy. The idea is to do a hot treatment such as a sauna, steam bath or outdoor Jacuzzi, then, if you’re brave enough, hurl yourself into an agonizingly cold pool or stand under a frigid waterfall trying to shriek in silence while wondering why you are torturing yourself. And then you leap out of the cold pool and the endorphins fly and your circulation is boosted and you feel deliciously cold on the outside, toasty on the inside and are ready to take on the world – or maybe even the Pacific Crest Trail. 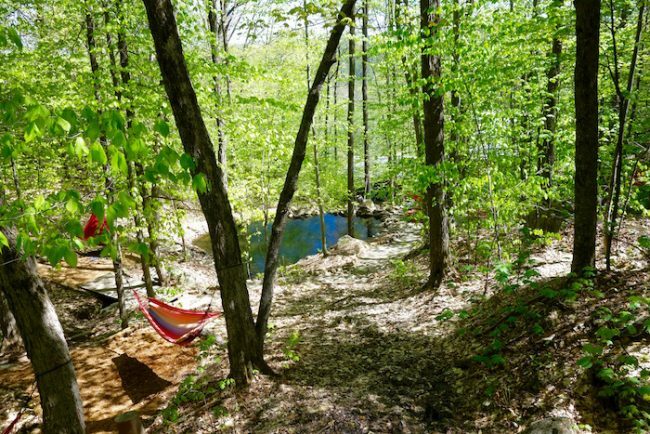 Then you relax in one of the comfy chairs around the wood fire surrounded by maple, beech and spruce, or lie in a hammock, or rest inside one of the relaxation rooms. Then you do the hot cold circuit again. And again. Until eventually you feel more like a limp leaf than a powerful rock face or a fat tree in the forest, and at this point you could care less if your hiking boot falls off a precipice because you’d rather lie down than hike anyway. “It’s the ultimate relaxing activity,” Patrice said. “We want each person to have a beautiful experience in nature, in the forest as it originally was. We want people to say La Source is ‘my’ spot. Maybe that’s why I wanted the Meditation Walk all to myself. Because Spa La Source is ‘my’ spot already. What to do at Spa La Source: Besides the hot/cold/relax circuit, you can get a massage at their massage centre, and if the weather is nice you can have your massage outside. You can do the Meditation Walk, lie in the (very very dark) Dark Room or just soak up the beauty of the forest and read a book by the wood fire. Where to eat at La Source: You won’t want to miss a healthy lunch at The Bistro located onsite. The menu is light, delicious and the dishes look … pretty enough to eat. 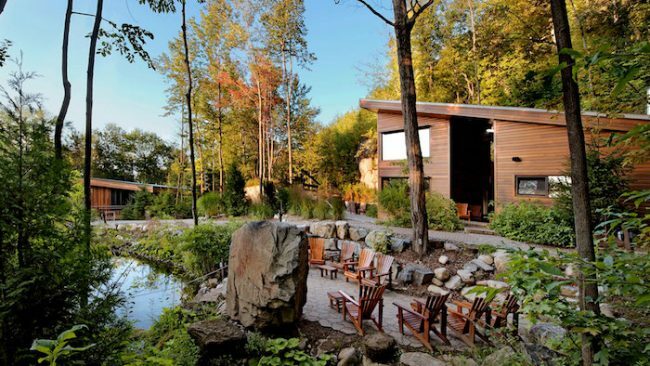 A spa with a green philosophy: La Source is an environmentally conscience spa. Some of the eco techniques they use include geothermal power for heating, a green roof, high performance windows and insulation, and recycled raw materials that come from the site itself, including wood, rock and soil. From Montreal, take the Pont Papineau or the Pont Pie IX. At St. Esprit take Route 125 North. After the village of Sainte Julienne, take the right fork (Route 337), towards Rawdon. At the first traffic light in Rawdon (at the intersection of Restaurant Tournesol, IGA and Maxi), turn left on Queen Street. Spa La Source is at the end of Queen Street. Access to the Nordic Baths are $47. Bonus: If you go Monday to Wednesday from 5 p.m. to 8 p.m. or Thursday from 6 p.m. to 9 p.m. the cost is $28. Weekend evenings it’s $36. Another bonus: Women get 25% off the regular price on Tuesdays, and men get 25% off on Wednesdays. For more information on La Source Spa visit their website. For more information on Lanaudiere and its neighbouring region Mauricie visit Authentic Quebec. This is an adult’s only spa for 18 years of age and up. There are a lot of steps leading up to the spa, so it isn’t ideal for people with limited mobility. What to bring to the Nordic Baths: Bring a bathing suit, beach sandals or flipflops. You might want a book. Bring a bathrobe or coverup, or you can rent a bathrobe for $15.00 (I’ve gone without a robe, it’s not absolutely essential.) Towels are provided. Read more: My viking theory on why nordic spas are so popular in Quebec. Read more: about the spa and spa travel. Who doesn’t love getting pampered? I did get pampered but by traditional oil massages, and it was amazing. Relaxing at Spa La Source, sounds so enticing, and your wonderful pictures are the cherry on top. Would definitely like to check out these Nordic Spa’s also someday. I love spa days, too, Carmen. Thanks for writing in. Oh wow this place does look super relaxing. The meditation walk sounds interesting! You’ve sold me with that first photo! It looks fun and relaxing. Spa days are my favorite days, sometimes you just need to treat yourself :) Thanks for sharing and happy travels! 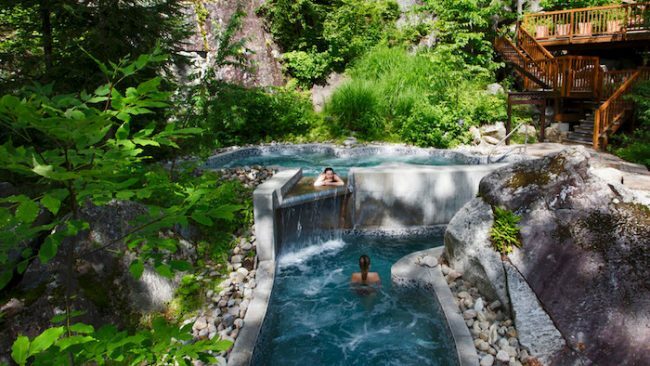 Sign me up for a wellness pilgrimage where I am left feeling like a limp leaf – La Source Bains Nordiques sounds fabulous, Carol! Thanks for sharing your experiences. Sounds lovely! I would love to try the spa there! I need to book a trip there! I love the philosophy of Spa La Source. It’s always a shame when trees are ripped out and the landscape leveled for new construction, so it is nice to see someone building resourcefully and respectively. I have done the Nordic spa thing in Finland, going from sauna, to freezing pond, to hot tub, and know that bizarre, yet invigorating feeling after the initial shock of the cold water! This looks like a nice retreat! I wonder though what Dark Room is for (to simply a lie in the dark?) because this is my first time reading about a dark room at a spa. I hope you get to La Source, too, Indrani. Thanks for reading. La Source is the ideal retreat, Elaine. I love places that incorporate nature, too. Sigh. Sounds like such a lovely retreat. I admire keeping nature close and part of the experience. Love your writing too. La Source Nordic Spa seems to be a nice place, hope I can visit some day.